The Vista Valley trail is part of the Skyway Nordic Trails in the Grand Mesa National Forest near Grand Junction, Colorado. The trail begins off of the Lions Loop at the end of the Arroyo trail where it travels leisurely up a serene valley. 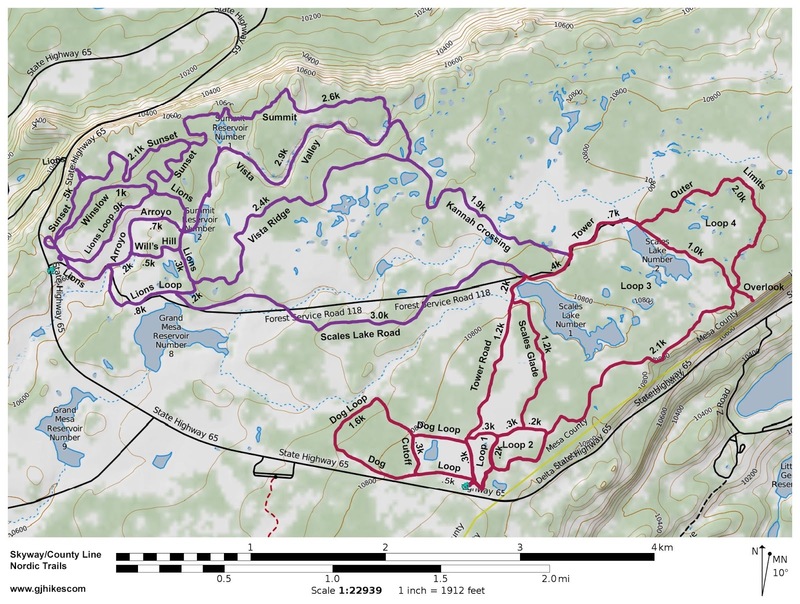 The trail ends at a junction with the Summit and Vista Ridge trails. The Vista Valley trail begins off of the Lions Loop about 1 mile from the Skyway trailhead. The shortest route is via the Arroyo trail. 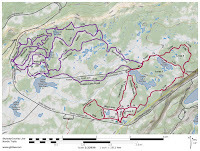 The trail follows a groomed route, that has a set of classic tracks and a skate lane, as it meanders up a shallow valley. Snowshoers should stay off to the side of the trail on the side opposite the set of classic tracks. For much of the distance the tall trees block the winter sun that is low in the sky above the southern horizon. The trail is easy enough that an extra layer might be needed to keep warm. Either that or perhaps expend a little more effort. We've done this trail on sunny days, snowy days and windy days when if it had been recently groomed you couldn't tell. There are a few minor bumps in the elevation that come more as shallow swells than hills. For the most part it is a gradual steady climb that barely nets 60 feet of elevation gain. The trail cuts a wide swath up the valley that looks to have been gorged out by a glacier. Whether that is the case or not we don't know but its U shaped sides and flat bottom bring that sort of thing to mind. The trail comes to an end at a junction with the Summit and Vista Ridge trails. Some people like to combine the Vista Valley and Vista Ridge trails into a loop but a good many people simply turn around and return the way they came. 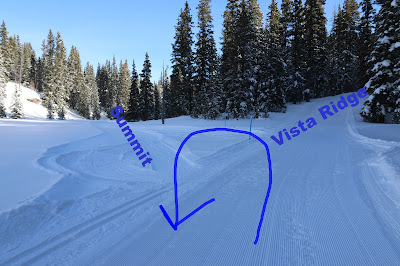 The Summit trail is narrower and isn't groomed with a set of classic tracks. It is also usually classed as an expert level trail due to quite a few hills. We've done them all but for this post we simply turned around and went back the way we came. Vista Valley is such a pretty trail that if it is all you get to do you should still have a very enjoyable time. If you would like to see it for yourself then all you have to do is 'Take a hike'.